As the most watched comedy program worldwide and one of the longest running American sitcoms currently still airing, the popularity of ‘The Big Bang Theory’ is beyond question. Fans of the show will be elated to have the opportunity to get their hands on an original script from the 2007 pilot episode of the hit comedy series at auction platform Catawiki, where it will be auctioned off to the highest bidder. 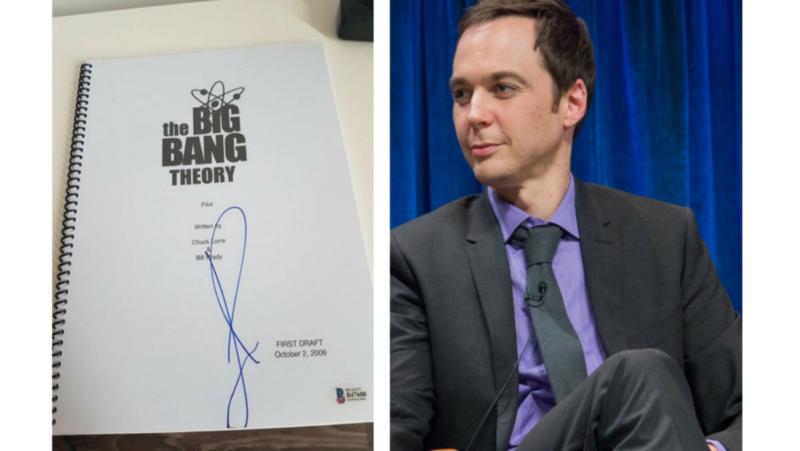 The script is even more special because it is signed by the shows’ leading star Jim Parsons, who plays the slightly socially awkward Sheldon Cooper. This makes this object very sought after by collectors and fans alike. According to Catawiki’s in-house expert Mark Harrison, specialised in signed books, the script is pretty rare. “The script is from the very first episode, which aired almost twelve years ago now. It’s pretty unusual for such a script to have survived the years in such a good condition. For each episode there are always a few scripts printed for the cast and crew, but usually they are thrown right away after the filming of the episode.” The script is 52 pages long and extra special, because it’s signed by its leading star, Jim Parsons, who stars in the show as Sheldon Cooper. He is often cited as the main reason for the show’s success, both by critics and fans alike. Parsons was nominated for an Emmy six times for the role, going home with the award four times. He also won an Golden Globe Award in 2011 for Best Actor in a Television Series - Comedy. How the script ended up at the auction of Catawiki? According to Harrison someone on the production team had it signed and then brought it home from the set. The script will be auctioned via Catawiki, the online auction platform for rare and harder-to-find objects. The auction runs from 25th May until the 3rd June and is under the supervision of Mark Harrison, an expert in signed and ancient books. Click here to view the auction.